Which room do you think is the most dangerous in your home, the kitchen seems to be how most of us would answer, since there are fire and electrical hazards. To our surprise, studies have proven that the bathroom can be one of the most dangerous areas in your home. One out of every three people over the age of 60 will experience at least one fall yearly, and you guessed it – usually happens in the bathroom. For those of us who have aging loved ones, making their home senior friendly should be top priority. Adding grab bars or hand rails is one of the most inexpensive ways to accomplish this. Gordmay, your grab bar installation Ottawa experts will arrange a site visit to and provide useful tips on areas that grab bars would be beneficial. 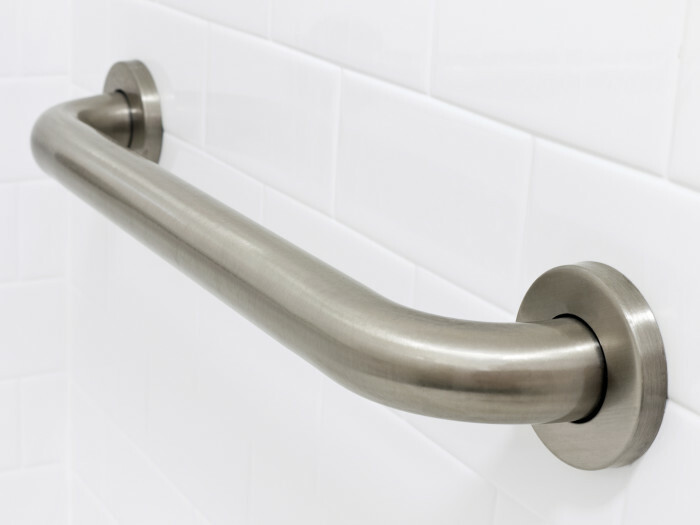 Let’s face it – everyone benefits from grab bars whether you’re a senior or not. We know this by the amount of calls we get that someone slipped and grabbed onto the towel bar to steady their balance and ripped it right off the wall. Towel bars cannot withstand an average person’s full or partial weight. Grab bars must be properly mounted into the studs in your wall, not with a simple easy anchor into the drywall. 1) Ensure they are long enough (at least 18″) so that it is ample to grab in the event of a fall. Grab bars that are too short will not do the trick. They are typically installed approx 3′ off finished floor height, but this can be modified to meet the needs of the individual. 2) Areas of your home that could benefit grab bar installation. It’s not just the bathroom, we have found that bed-side walls and front entrance ways are also great areas to consider. There are a few finishes now available such as polished chrome, stainless matte finish, white or bronze that will be esthetically appeasing and no longer give an institutional feeling. 3) Grab bars are a very personal thing, give some consideration as to whether they would be more useful if installed horizontally or vertically, only the individual using them will know what feels best. A vertical installation is common at the entrance and exit points in a shower depending on which side the individual uses. Make the call to Gordmay today at 613-715-4841 or fill out our contact us page. We will meet with you in your home and discuss various ways to ensure your home is a safe home for your loved ones.